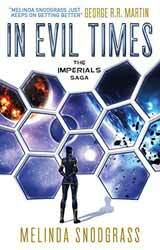 In Evil Times: The Imperial Saga (2017. 392 pages) is the second in the trilogy, written by Melinda Snodgrass. I wasn’t that enamoured of the first book in the series although I could not quite put my finger on what was awry, with the second book some of the objections have come into focus. If the book is about anything it is prejudice: social, sexual and cultural. In fact there is so much ingrained prejudice between various sections of this civilisation that it is a wonder that it works at all. The humans have constructed almost a feudal system based on a constitutional monarchy, this is the main reason that Tracy and Mercedes love is doomed before it even takes off. When he is posted to his first ship he meets more prejudice as the members of the officer class treat him like an upstart, only fit to be put in his place. As a reader we should be behind Tracy as he goes through his trial and tribulation. Well, we should if it were not for the fact that he is just as odious as the people persecuting him. He thinks nothing of treating his alien batman with callous distain, even to the point of offering physical punishments. He does little, for the majority of the book, to even question the almost slave status of aliens in the empire. When he does have dealings with Mercedes his behaviour is that of a truculent child who has been denied his prized toy. Mercedes is a more sympathetic character. As the defacto heir to the throne you would think that her elevated status would offer some protection, but she suffers from the fact that she is a woman and that the majority of men around her feel threatened, not because of her status but because she is a better pilot and soldier. Her father's desire to have more women serve in the armed forces is a pragmatic one; humans are significantly outnumbered by the aliens. But the resentment and belittling of women as anything other than wives and baby factories leads one of Mercedes' friend to be raped. Against this background Snodgrass throws in a possible external threat, which goes nowhere in this novel, but I suspect will feature heavily in the next. Cut away the political and emotional baggage and the story really has the characters engage in just two instances, each of which has a profound impact. Snodgrass is a good writer, but I am not convinced that a society which had these layers upon layer of institutional and culturally accepted prejudice would actually be able to create a cohesive whole without the constant threat of war. And while there is some movement in Tracy’s world view, it’s a little too late as he remains an unlikable character. In fact all, except one of the male characters, are dislikeable, unlike the female roles which are written more sympathetically.